"the practice of intentional, focused attentiveness to the more-than-human world, guided by honesty and accuracy"
I am the Executive Director of the Natural History Institute, which promotes an integrative approach to natural history--demonstrating that natural history is larger than science alone. Indeed, one way I've defined natural history is as "the practice of falling in love with the world." Our mission: The Natural History Institute provides leadership and resources for a revitalized practice of natural history that integrates art, science, and humanities to promote the health and well-being of humans and the rest of the natural world. The Institute began as a program of Prescott College in 2012 and became an independent, nonprofit organization in 2017. I was the Principal Investigator on a National Science Foundation project to reverse the growing trend away from field studies in biology and ecology education. This on-going project, "The Decline in Field Studies: Proactive Strategies for Essential Training for the Next Generation of Biological Researchers," convened a working group of practitioners from a wide variety of institutions to assess these trends, their possible causes, and to suggest strategies to revitalize field studies in American higher education. 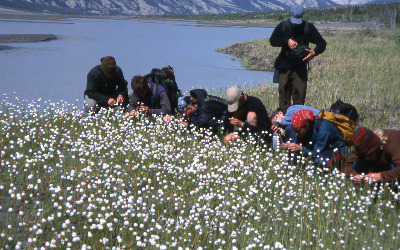 Where else better to learn how living systems work than in the field, directly immersed in nature? We recently published a paper, "Teaching Biology in the Field: Importance, Challenges, and Solutions," in BioScience, as well as a short video and several other products. You can access much of this work here. With my colleagues Josh Tewksbury and Kirsten Rowell, I was a Principal Investigator on this project--funded by the National Science Foundation (a collaborative grant to the University of Washington and Prescott College) and the University of Washington College of the Environment, with additional support from Prescott College, Canon-USA, and the National Center for Ecological Analysis and Synthesis. We convened four gatherings of prominent and upcoming naturalists of diverse backgrounds--research scientists, visual artists, poets, psychologists, and more--to consider pathways toward revitalization of natural history in the 21st century. A direct outcome of the Natural History Initiative, this exciting media project, developed by the creative talents of Benjamin Drummond and Sara Joy Steele of bdsjs.com, documents conversations between naturalists at these gatherings, in audio clips accompanied by black & white photography. This project has been featured at the annual conference of the Ecological Society of America and at the Wild and Scenic Film Festival. Sewall, L. and T.L. Fleischner. In Review. Why ecopsychology needs natural history. Ecopsychology. Fleischner, T.L. 2017. Our Deepest Affinity. Pages 3-15 in T.L. Fleischner, ed. Nature, Love, Medicine: Essays on Wildness and Wellness. Torrey House Press, Salt Lake City, Utah. Fleischner, T.L., editor. 2017. Nature, Love, Medicine: Essays on Healing in Wildness. Torrey House Press, Salt Lake City, Utah. Fleischner, T.L. 2017. Our Deepest Affinity. Pages 3-15 in T.L. Fleischner, ed. Nature, Love, Medicine: Essays on Healing in Wildness. Torrey House Press, Salt Lake City, Utah. Fleischner, T.L. 2014. An invitation to attentiveness and imagination. Questions for a Resilient Future series, Center for Humans & Nature. http://www.humansandnature.org/earth-ethic---thomas-lowe-fleischner-response-97.php. Fleischner, T.L., editor. 2011. The Way of Natural History. Trinity University Press, San Antonio, Texas.